After releasing her debut EP Patchwork in 2012, Szjerdene captured the attention of Bonobo, thus starting a flourishing partnership that saw her collaborate with him on his fifth studio album The North Borders. Since then, Szjerdene has continued to work with Bonobo - both on tour and in the studio. 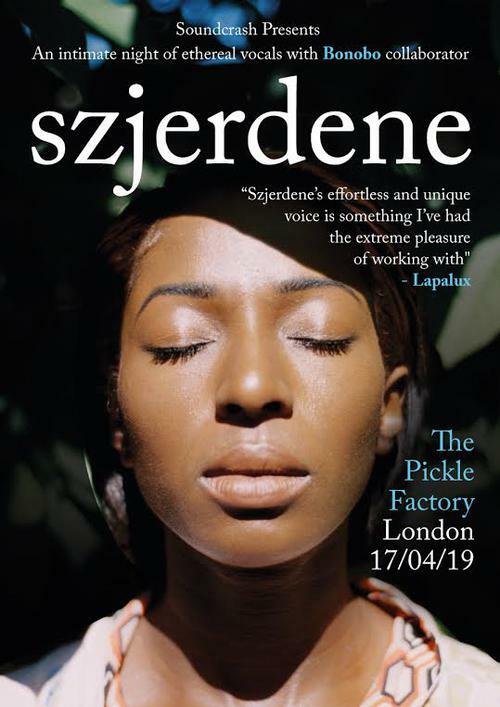 Following her work with him, and cementing herself as a fixture in the UK electronic music scene, were Szjerdene’s collaborative efforts with Essex producer Lapalux. This collaboration saw the release of critically acclaimed EP Paragon. Now, Szjerdene is raising the bar with the release of her third solo EP TRACE, a move that will surely see her at the centre of the UK’s soul scene. TRACE, released on the 22nd of March 2019, will be premiered exclusively at The Pickle Factory. Expect nothing short of an exceptional live show of soulful vocals and spellbinding visuals. A truly unmissable event for lovers of slow-burning, heartfelt soul.